Today we have the name “sourdough” for a type of leveling which has really been around for thousands of years. In the Bible, they talk about unleavened bread. Their version of unleavened bread was probably the same as our sourdough in that it uses wild yeast spores to generate the carbon dioxide gas to make the bread rise. The miners of Alaska and the Northwest Territories became so identified with the sourdough starter that they were generically called “sourdoughs”. Cowboy cooks were sometimes retained or fired on the quality of their sourdough baking skills. The start or starter is the key to the operation. Today, sourdough and Dutch ovens just seem to naturally go together. So try it and gain an enviable skill with your black pots. Let’s start with some general ground rules for the use of sourdough. Starters can be borrowed, bought, or made. If you want to “start” one from scratch, here are a couple of simple methods. Put a package of dry yeast, one cup of milk, and one cup of all purpose flour in a large non-metal container and let it stand on the cupboard for 2-3 days. By that time it should be bubbling and sending out a pleasant sour aroma which means you are in business. Another starter method is one cup water, one package yeast, ¼ cup sugar and one cup all purpose flour. Don’t keep any metal in prolonged contact with the starter. The acid in the starter reacts with it. Use glass, plastic, or a crock to keep it in. Use daily if you keep it out, about weekly if you keep it in the fridge. Also don’t put a tight cap on it; the CO2 will blow the cap and the starter all over your habitation. If some liquid separates on top, stir it back in if it is orange colored. Throw the whole thing out and start over if it is green colored. Every time you use some of the start, put back in at least an equal amount of flour and milk or water for the amount you want to keep on hand. You can use either one of these two starters but pancakes and rolls will be a little tougher with the water starter. If your starter gets a bit strong, or a little flat, take half of it out and replenish with equal amounts of flour, milk or water and let it stand and revitalize itself. In the 1800’s, the sourdough starter was the basis of practically every meal. From it one could manufacture bread, biscuits, cornbread, pancakes, and desserts. The cowboy preferred sourdough bread to any other kind. Baking powder biscuits he could eat with only a mild complaint’ buttermilk biscuits were passable; but none of them measured up to sourdoughs. Types of containers to store your sourdough starter in can be plastic, wood, glass, or a crock. I have used all types but prefer a crock or plastic. Which ever you choose never put a lid on tight or the gases caused by fermentation cannot escape. A one gallon plastic container makes a good receptacle for your starter. Punch a hole in the top of the lid for the gases to escape. Also when mixing sourdough use only plastic, glass, or wooden bowls and spoons. Sourdough after added to a recipe needs to have time to rise before baking. It will usually rise to double its size if given a chance before baking. These are just a few hints and pointers for the use of sourdough and we will continue on now with how to incorporate sourdough into your cooking and baking skills. You can incorporate sourdough starter into any recipe that calls for a source of liquid to some degree. Biscuits, cakes, pies, bread, and rolls will all taste better made with sourdough starter. Remember a timid baker does not make a good baker. You may end up with some flops or bad bread while learning, but that’s part of the learning process. I’ve had some failures myself before perfecting the art of baking in a Dutch oven. So don’t give up and keep trying and every effort will continue to get better until you too will become an accomplished baker and Dutch oven cook. Let’s go into some recipes for the month and I hope you have a pleasant experience for they are relatively simple. If anyone has questions feel free to email or phone. Combine dry ingredients together with liquid ingredients and mix until incorporated. If dry, add a little milk gradually until you have a soft dough that you can handle. Take a plastic bowl and put one stick of melted butter in the bowl. Turn dough out into bowl and coat with butter. Melt another stick of butter in your oven. Pinch dough off and roll into balls and place in oven with sides touching. If dough sticks to your hands, coat them with butter. Makes 20 biscuits. Place oven over slow heat on bottom and moderate heat on top. Remember to rotate your oven ¼ turns top and bottom to eliminate hot spots. The biscuits will cook in approximately 20 minutes, depending on your heat source. A reminder – biscuits have to be watched closely throughout the baking process. They will burn on the bottom if you do not rotate your oven. 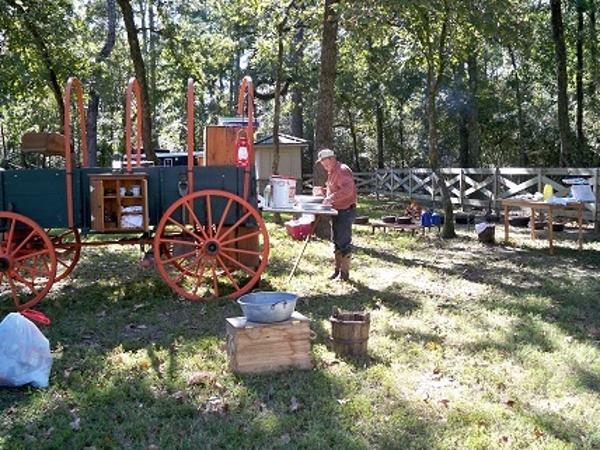 In a “Chuckwagon” competition which we enter, one person will be in charge of the biscuit baking and that will be their only job. Mix all dry ingredients together. Cut butter into dry ingredients until coarse and crumbly. Add starter and buttermilk and mix until a soft dough forms. Turn out into a bowl or surface dusted with a small amount of flour. Sprinkle flour over top of dough. Use only enough flour to keep dough from sticking to your hands. Do not kneed flour into dough. The less flour you use so you can handle the dough the better. Kneading excessive flour into the mixture will make your biscuits heavy and tough. Take the 12” oven and pour ½ c. oil into the bottom. Dust your hands with flour. Pinch off dough into balls 3” in diameter or pat dough out to a 1 ½” thickness and cut with biscuit cutter. Place biscuits in oven being sure to oil both sides and let the biscuits touch in the oven. Let rise for 30 minutes. Bake with slow heat under bottom and moderate heat on top for approximately 30 minutes. For conventional oven, bake at 450° for 20 to 25 minutes. In a large bowl, combine the water, yeast, and one tablespoon of sugar. Stir until the yeast dissolves and wait about 10 minutes for the yeast to foam up. In another bowl, combine 4 c. of the flour, cheese, jalapenos, bacon bits, ½ c. sugar and salt. Set aside. Add the oil and eggs to the yeast mixture and stir. Add the dry ingredients to the wet ones and stir until a ball is formed. Place on a lightly floured surface and knead until smooth and elastic (about 10 minutes). Place the ball in an oiled bowl and roll the ball around until it is oiled on all sides. Cover bowl with a dry heavy towel and put in a warm place until it doubles in size (about 1 hour). Punch the dough down and pinch off enough to make 2” balls. Roll each ball in your hands and arrange snugly in a 12” inch, warm oiled Dutch oven. Put the lid on and let rise again. Bake with slow heat on bottom and moderate heat on top for 55-60 minutes. Remember to turn or rotate the oven and lid ¼ turns every 15 minutes to distribute the heat and eliminate hot spots. Makes 12-15 rolls. For conventional oven, bake at 400° for 45 to 50 minutes. The night before, mix starter with water and 2 c. flour. The next morning melt butter into milk. Dissolve yeast into milk and add to starter. Thoroughly mix and stir in honey into mixture. Add 2 c. flour and mix completely. Then sprinkle on a mixture of salt, soda, and sugar, folding in gently. Let stand for 35 minutes or until bubbly, then add the rest of the flour, making a stiff dough. Knead the dough until silky smooth. Place in a greased 12” inch Dutch oven and let rise to the top in a warm place (approximately 2 hours). Bake in a preheated oven at 350°. This will be an oven with moderate heat. Bake for 40 minutes or until done. Mix together starter, egg, and evaporated milk. Combine the remaining ingredients and sprinkle over the top. Fold in with a large spoon. This may make the batter foam so that the pancakes are nothing but bubbles. If so, wait till it calms down for 5 minutes or so and then stir it some. Make pancakes about 6 inches in diameter. Use your oven lid upside down on a couple of bricks as your griddle. Heat lid hot enough to make water drops dance. For conventional method use electric griddle at 350°. Combine dry ingredients. Add eggs, starter, and milk. Mix together and pour into 12” oven with ½ c. oil. Heat oven before pouring in mixture. Bake with slow heat on bottom and moderate heat on top for 30 minutes. For conventional oven, bake in 13 x 9” pan at 400° for 30 minutes. Cream shortening and sugar. Add eggs one at a time, beating after each addition. Stir in starter. Add oil to mixture. Mix together flour, cocoa, baking powder, soda, and salt. Add water, vanilla, and pie filling. Now combine all mixtures together and stir gently until incorporated. Pour batter into greased 12” oven. Bake with coals on top and bottom for 10-15 minutes. Remove from coals and continue baking from top only for an additional 10-15 minutes or until cake is done. Allow to cool for 10 minutes, then invert on a platter. Cool thoroughly and frost with your favorite frosting. This is a little history and uses of and for “Sourdough”. So mix up a batch of starter and try one or all of these recipes. See you next time! If you would like to comment on this story, w'ed love to hear from you. Your name and your comment will be posted in Letters to the Editor.